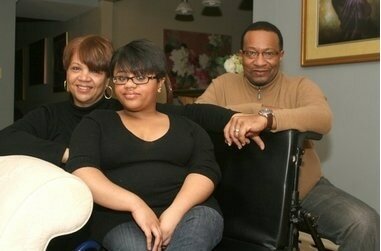 SPRINGFIELD - Born with brittle bone syndrome, Brianna Johnson suffered 40 fractures by the time she was 8 years old. Today, she is 20 and on track to graduate in May with degrees in women, gender and sexuality studies, as well as legal studies from the University of Massachusetts in Amherst after just three years. Some might consider a diagnosis of osteogenesis imperfecta and life in a wheelchair a confinement, but she and her family feels blessed. And, together, they work to inspire other families. “We are people of extreme faith,” says father Ronald D. Johnson. Donna M. Johnson says she thanks God every day for choosing her as Brianna’s mother. “When I gave birth to her I saw her as a blessing and saw this as a journey - personally, intellectually and creatively,” Donna Johnson said. • When: Jan. 15, 6 p.m.
Osteogenesis imperfecta is a genetic bone disorder characterized by fragile bones that break easily. It is also known as “brittle bone disease.” According the the Osteogenesis Imperfecta Foundation, the term literally means “bone that is imperfectly made from the beginning of life,” meaning that a person is born with this disorder and is affected throughout his or her lifetime. Brianna Johnson’s physical disabilities have not restricted her from achieving impressive goals. As a student in the International Baccalaureate program at the High School of Commerce she graduated with nearly a year’s worth of college credits. Those credits helped set her on a course to complete her college studies early. She credits the support of her parents and the high standards to which they have always held her as the catalysts of her accomplishments. rianna, her parents said, may have been born with a physical challenge, but also with a sharp intellect. “I’ve always felt that if you have the tools you need to succeed there is no excuse not to,” Brianna Johnson said. The key to Brianna’s success, according to her dad, is that he and his wife never treated their daughter any differently. Brianna has one brother, Ronald X., who is 25 and attends law school at the University of Connecticut. “We never treated her like she was special person,” her father said. “She just uses a wheelchair to get around.” The elder Johnsons’ spirit of community service is one they have instilled in both their children, and Brianna believes strongly in helping to provide others with opportunities they might not have otherwise had, she said. The fund provides the families with financial resources to obtain the durable and adaptive equipment for children with disabilities. It serves families with children from birth to age 22. To that end, the Johnson family is in the midst of planning the 13th annual Martin Luther King Jr. Gospel Concert for Saturday. It will feature Three Tenors in the Spirit - prominent spiritual leaders in Springfield. The Revs. Calvin J. McFadden, of St. John’s Congregational Church, Steve R. Williams, of Revival Times Evangelistic Center, and Mark E. Flowers, of Mount Calvary Baptist Church, will lead the congregation at the Evangelical Covenant Church, located at 915 Plumtree Road, in a celebration of the life, ideals and spirit of Martin Luther King Jr.